Rigid Foam Board and Spray Foam Insulation are newer technologies that have only been around for a couple of decades. If your home was built prior to 1980 your builder probably used fiberglass to insulate your crawl space. 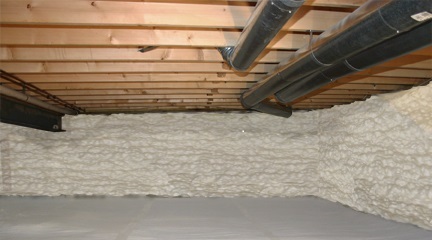 Fiberglass is a great insulating product but it works best in the dryer areas of your home. When fiberglass batt insulation is used in crawl spaces it will absorb moisture, get moldy and eventually separate from the floor. The end result is a moldy, messy crawl space that is no longer properly insulated. If you want to insulate your crawl space properly then you need to use Rigid Foam Board or Spray Foam insulation. While it is more expensive then traditional fiberglass batt insulation, it has a better R-value, can be sealed airtight and resists moisture very well. Instead of putting the foam between your floor joist, foam based products are applied to the exterior walls. This is the first step in the process known as air sealing or encapsulating the crawl space. Many crawl spaces have built-in ventilation systems to promote air flow throughout the space. This was a building code enforced design prior to the 1980 that was intended to keep the area below your home dry. Recent studies have shown the exact opposite is true. Advancements in the building science industry has proven without a doubt that an encapsulated crawl space can can keep the area dry and reduce your home's energy use my as much as 20%. The encapsulation process usually begins by sealing the air vents on the exterior walls of the home. The next step usually consists of a moisture barrier that is installed over the floor & walls.The exterior walls are then layered with rigid foam board or spray foam insulation. This creates an air tight seal between your home and the outside air. The idea is to treat your crawl space like any other room of your home. Over the past 10 years, advancements in building science have proven without a doubt that vented crawl spaces can lead to problems with mold, moisture, insects and wood rot. These symptoms are most often noticed in the humid summer months but can occur almost anytime. Most homeowners will contact a heating and cooling contractor to solve their problems. Typically though, the problem is not due to a failure of the air conditioning system; it results from poor moisture control in the crawl space. Vented crawl spaces have higher humidity percentages then encapsulated crawl spaces. In the summer time, warm, humid air comes through the vents in your crawl space. When that warm air cools, condensation will form and the relative humidity in your crawl space will increase even more. A damp crawl space is the perfect breeding ground for mold and can lead to thousands of dollars in damage. Encapsulating your crawl space can be more affordable then you may think. The only way to find out is get a free in-home assessment. Our highly trained staff of insulation professionals has the knowledge needed to help dry out your crawl space and make your home more energy efficient.